Bong! Goes the bell in the rickety tower. Twelve times… that means it’s Spooky Hour. Listen! Hush! Oooh, what’s that sound? The midnight spooks are coming round. Get set for a creepy countdown stuffed with witches, ghosts, clickety-clackety skeletons and tramping trolls! Atmospheric words float, leap and dance across brightly illustrated pages in a rollicking, romping rhyme that’s perfect for every little monster! 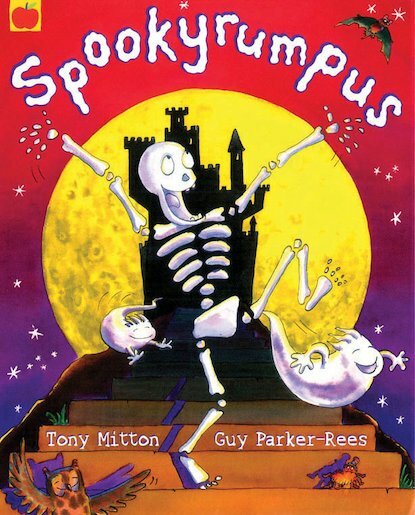 Tony Mitton is the best-selling author of SPOOKYRUMPUS, and the AMAZING MACHINES series. Scholastic also published his acclaimed poetry collections, PLUM and PIP. He lives in Cambridge.